5 YEAR WARRANTY ON OUR LG-7000 DIGITAL TENS Unit. Whether you have used a TENS Unit before, or purchasing for the first time, your decision to purchase a TENS Unit will be one of the best and most cost effective decisions you will ever make. The LG-7000 Digital TENS Unit has helped thousands of patients achieve pain reduction, leading to a higher quality of life. A TENS Unit / TENS Machine is a simple device to use. Most people do not understand how a TENS helps to relieve pain. It is actually very simple. 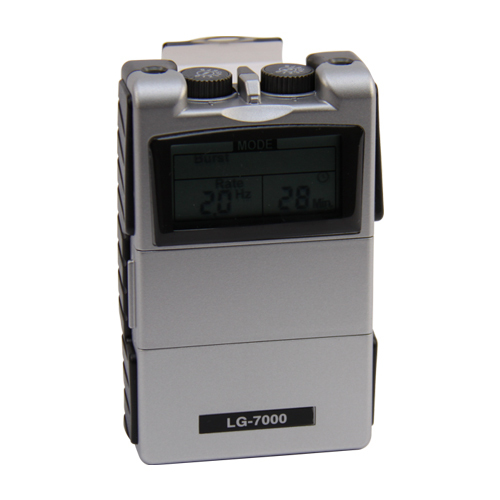 The LG-7000 Digital TENS Machine sends small electrical impulses that override the pain receptor (nerves) to the brain. Since the TENS Machines impulse overrides the pain receptor, the brain will not "interpret" the pain impulse. TENS Units are a "drug-free" solution that many people are not aware exists. 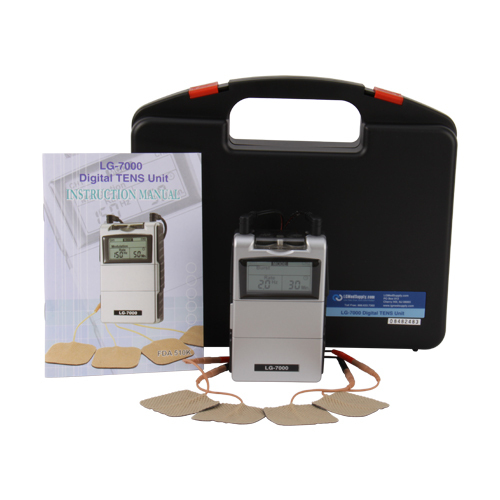 TENS Electrode Pads are placed near or around the areas in pain. Because the LG-7000 is a Dual Channel Unit, you can use 2 or all 4 Electrode Pads at one time. You control the pulse width, pulse rate, and intensity on the built in LCD Screen to find the best setting for you. You can use TENS Units as often and as long as you would like! Whether you have back pain, hip pain, foot pain, neck pain, shoulder pain, elbow pain, or any other pain in the body (acute or chronic), the LG-7000 TENS Unit will provide you with fast relief. If you have used a TENS Unit before you are aware of the benefits. If you have never used a TENS Unit, then this small battery operated device may be the "answer" you are looking fo. LGMedSupply units are recognized as one of the most effective units on the market. 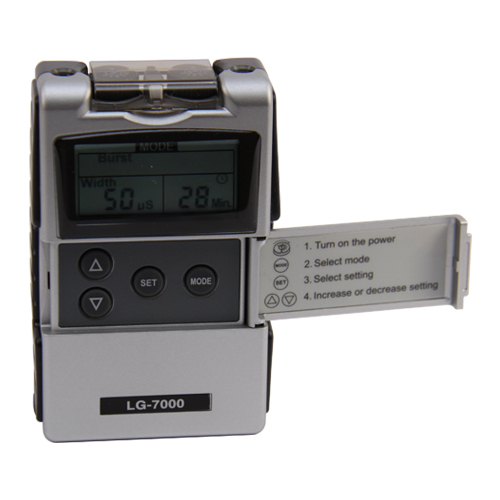 LGMedSupply's LG-7000 TENS Unit comes with a Satisfaction Guarantee and a 3 Year Warranty. Pain is a warning system and the body �s method of telling us that something is wrong. Pain is important; without it abnormal conditions may go undetected, causing damage or injury to vital parts of our bodies. Even though pain is a necessary warning signal of trauma or malfunction in the body, nature may have gone too far in its design. Aside from its value in diagnosis, long-lasting persistent pain serves no useful purpose. Pain does not begin until coded message travels to the brain where it is decoded, analyzed, and then reacted to. The pain message travels from the injured area along the small nerves leading to the spinal cord. Here the message is switched to different nerves that travel up the spinal cord to the brain. The pain message is then interpreted, referred back and the pain is felt. Don't forget to check out our Additional Pain Relief units, such as the "PRO SERIES" Portable Home Ultrasound Unit. Ultrasound Units help speed the healing process by reducing inflammation and swelling. The "PRO SERIES" Ultrasound Unit and LG-7000 TENS Unit make excellent combination therapy. Many of our customers like to utilize both for fast pain relief and healing. LG-7000 Digital TEN Unit. Awesome product! 5 I showed it to some friends. They should be getting their unit soon. Pros:The mobility of the unit allows you to take it wherever you go. Great purchase! battery in new tens unit not rechargeable 5 love the machine but was disappointed the battery was not a rechargeable one. i have recommended this machine to several of my friends. This is my second tens to purchase thru your company. Excellent 5 Love it weight, easy to use and great price of this wonderful prodduct! It gets me moving around for the day! 5 I have been using this little machine for over two years and I LOVE it!!! I have cronic back pains due to pinch nerves, and the TENS unit helps me with it so much. I HIGHLY recommend it! 5 Just ordered my second LG-7000. Agree with all that this unit is good value. Many posts about battery use and rechargeable batteries. Save money in the long run - Radio Shack and other stores have a 110V - 9V converters. Might have to modify the lead for the 9V contacts but I've found it well worth the investment in the converter. 5 This is a nice little Tens unit. I had to replace my old one,because I could not find the old style replacement wires. The electronic impulse seems much softer in a good way than the older units,but still carries a strong signal. The cover to prevent accidental changes in power is a big plus if you take it to work like me. If you have stiffness/pain or arthritis in your back constantly Tens can be a life saver. Good luck to all with your pain management. 5 I have had the unit for almost 2 yrs and have severe lower back pain and the pain has been going on since I was twenty years old. I finally went to see a nero specialist and was told that my disc in my back was starting to weaken. I went to a chiropractor and mentioned that I would like to have a muscle stimulating machine like his. He wouldn't tell me how to get one that i could use at home so I looked at the name of his machine and did my own research. The rest is history I haven't been back to a chiroprator in a very long time because I treat myself in the luxury of my own home. The tens unit really works wouldn' t take anything for it when I travel it travels with me. 5 I have read reviews of this site, had to judge for myself once I got the product I ordered. It came in 2 days by UPS. I received exactly what I ordered ,LG-7000, immediately read the documentation, put the battery in and put it into action. It performs above my expectations, is on its 8th hour on the included battery. I have had it on continuous that long...I should have ordered the 9 volt battery and charger, as I made three trips to find one in my area and didn't succeed so had to order separately with more shipping cost. So far, I highly recommend this device. It is powerful and does the job I need it to do to negate the pain in my shoulders and other areas of strain/arthritis. I also recommend the good price on the electrodes. They are high quality and last at least 20 uses if you care for them by the instructions. 5 This works great. I've had this for almost a year. I use it almost every day all day. I've had chronic back pain for over 12 years and this really helps me get through the day. I like the clip. It's made of metal. The clip is positioned so that the unit doesn't stick too far up at your waist. I've had a couple TENS that the clips were plastic and kept coming off or breaking because the unit sat too high up at your waist. I'm buying another one to have in case something happens to the LG-7000 I have now. I recommend that you get rechargable batteries. I use about 1 1/2 batteries a day and the cost is overwelming with regular 9 volt batteries. 5 've been going to the chiropractor for years now. He always warms me up with his Tens Unit. Im sure his costs 10 to 20 X more. I enjoyed it so much that I ventured out and bought this one. I thought it wouldn't compare, especially when I had the unit in my hands. It only takes a 9 volt battery! I was happily surprised when the unit did everything I expected and more! I still havent been able to put it on full, its that strong! I have since bought 2 more for family due to the amazing price and the great job it does on my back. You will need to buy more pads if you use it like I do. But well worth it. 5 am so happy with this LGMedSupply LG 7000 TENS Unit. I've had a couple TENS' units through the years that I ordered from the doctor's office. This one is as good as the ones I ordered from the doctor. It has a nice case to store the unit and accessories and I'm very pleased with it. It really does help with back pain. Delivery was prompt and I'm very happy with LGMedSupply and would definitely buy again. 5 Recently purchased this product and it works great, plus I have a one year warranty so if anything breaks or if it doesn't work I am covered. I have been suffering from tennis elbow for several years but after purchasing this product I can feel confident about playing tennis and I am not afraid of putting the most effort which I was before when I didn't have this unit. 5 Several years ago I used a TENS unit borrowed from my physical therapist for a pinched nerve. So, when I recently got a very painful case of shingles, I decided to purchase a unit. Well, this unit has kept me sane! I use it nightly to offset my jangly and painful shingles-affected nerves. Mine are on my leg and back. Ice helps but the TENS unit allows me to fall asleep. I have my TENS set for 45 minutes. I put the pads on the affected spots and by the time it turns off, I'm asleep. The pads and wires are small enough that even when I am lying on them, I am not bothered by them. The unit beeps to let me know when it has timed out. That usually wakes me up enough to take the pads off and set the unit aside before I end up tangled in the wire leads. The only thing I would change is that it would be nice if the two sets of leads could have different settings. However, that obviously would increase the price dramatically. Since I appreciate the affordable price, I'm not complaining. The pads have lasted quite a long time. I find that periodically giving the sticky side a quick rinse with cold water, shaking them off, and putting them back on their plastic pad helps with that. I've been using mine for three weeks and just ordered a new set. At our local med supply store a set of 4 was !!! Online here on Amazon, three sets of 4 cost .66 plus .99 shipping. Thank goodness for Amazon. If you have nerve pain, I highly recommend trying this unit. ADDITIONAL COMMENT: If you've never used a TENS unit, you may find the many settings options a bit overwhelming. You may need to contact a doctor of physical therapist for advice since the manual is very technical. For my shingles, I used NORMAL mode I tried the pulsing affect but it feels too much like the nerve dance from shingles. For the wavelength I used 120 Hz and a width of 100 mS.
5 I am so happy with this LGMedSupply LG 7000 TENS Unit. I've had a couple TENS' units through the years that I ordered from the doctor's office. This one is as good as the ones I ordered from the doctor. It has a nice case to store the unit and accessories and I'm very pleased with it. It really does help with back pain. Delivery was prompt and I'm very happy with LGMedSupply and would definitely buy again. 5 ectrodes and Battery Misc. Purchased two of these a few months back for me and my wife. Was a little skeptical at first because of the claims for such a small device. I had a much larger unit years earlier and being a Coach and Athlete I didn't think the little unit would totally measure up. Well, it did. It's powerful enough to help in recuperation in the muscles and gets the job done. Although not as powerful as my older, larger and much more expensive unit ... It's lightweight and easy to travel with. Well worth the purchase. 5 I purchased this unit because of chronic back problems. This unit delivers powerful stimulation to aching muscles at a reasonable price. It is just as powerful as more expensive models and is easy to use. I was so happy with it, I purchased another TENS unit so my husband could have one, too. He is very pleased and said his unit is stronger than another brand he saw demonstrated elsewhere. The other unit cost almost three times what this TENS unit did, so I would definitely recommend this product. Note: It works on aching muscles, so if your pain is in the nerves, however, this might not be of help to you. 5 I developed a muscle spasm in my upper back due to bad ergonomics at work. I'm a muscular guy who works out every day so I was really taken aback by this. In short order, I was at the doctor who gave me a shot but said therapy was the only way to correct the issue long term. My therapist was a nice guy, I went to 2 sessions a week for nearly three months. Obviously all this stuff costs money. My expenses were more then not including the massive time lost by driving to therapy twice a week, the hour of therapy, etc. My therapy sessions were essentially being hooked up to a larger standing version of this device for 1/2 hour, followed by about 5-10 minutes of manual massage and then light back exercises I can do ay my gym. The only thing that felt like it was worked was the electro-simulation. I'm telling you, if your situation isn't life altering or serious buy this unit and skip the therapy. Google exercises and read the manual that comes with the device. Or even better-go to the therapist, see what they do then copy and save yourself a few hundred dollars and hours of your life. My problem never fully went away until I began self treating this unit. Within two weeks I was fine. Experiment with different pad placement until you find what works. The pads will lose their sticky ability over time, so make sure to stay stocked up. 5 Hello, TENS 7000" Digital TENS Unit Pain Relief Unit w/ 5 Modes with Carrying Case, Electrodes and Battery is an awesome unit. HIGHLY recommend easy to use, great features. The unit comes in a hard case to protect the until and small amount of supplies and battery was included. There was also a surprize bonus from LGMedSupply.com a prescription card that saves you 50% to 75%. 5 The tens 7000 arrived yesterday as described in the ad. So wanting to start slow I and play around with the different modes and settings I gave it a test drive on my forearm to see what it could do about the pain of my tendinitis. After 4 min at the recommended low settings the pain was gone, and remained gone for the rest of the evening and this morning as I sit writing this review though the pain will reoccur. Understand this device cures nothing but it does mitigate the pain and that is good enough. If you have osteoarthritis like me this device is worth a shot. this could end up being a important option in the control of my cronic multilocation pain back knee shoulder. I have read that these devices do not work for everyone but as the saying goes nothing ventured nothing gained.side effects as described in the literature seem to be less then insignificant.that is unless you put it over your heart front to back and risk heart issues or say on your temples to induce your version of electroshock therapist. 5 I am very pleased with this product, for the price. I ordered extra electrodes right away and recommend that you do too. The electrodes eventually lose their stickiness and need replacing after about a dozen uses. It certainly is not a high powered machine, like the more expensive models I've tried in the past, but it does a fine job on my occasional lower back & shoulder pain. Using it right away when I have pulled muscles can often prevent a trip to the chiropractor. 5 LOT of injuries. Every time I have gone to a therapist I have been treated with the TENS unit and it always helps, all those units were the real expensive ones that are powered through a power outlet. I got this unit and it works the EXACT same way. I barely had the settings up and was receiving the same amount of pulse as the larger ones. Great price for this product, glad i purchased it. 5 I thought even after reading reviews of this product that I would be disappointed with the power. No, I was wrong, this seems like the ones used at the doctor's office. I am still enjoying trying all the settings. What a great deal! 5 I was paying a pop for physical therapy. All the weight stuff was no issue, but I loved the electric stimulator. I have since done my own rehab using this item and have had the same if not better progress since. Like several others have said I dont have the heart to go past level 4 of 10, so it is plenty powerful. I'm still on my 1st 9 volt battery. AWESOME PRODUCT. 5 My lumbar vertebrates straightened out bulging and pushing an L5-S1 disc into the right side sciatic nerve. Couldn't stand nor sit upright longer than 30 seconds w/o screaming pain in right calf muscle. This included driving a car. Yeah, I looked like a mad man behind the wheel from all the screaming to help ease the pain. But then, I got the TENS in my hands. Oh what relief! I've used a TENS unit years ago borrowed from a chiropractor. It did wonders then as it did when I purchased this unit. It made my day. Its now tucked away in its case if and when I ever need it again. Battery life is very, very long. If you have back or muscle pain you will NOT go wrong with a TENS. 5 I love this product for my lower back pain that i get sometimes. I have used it 3 times so far and 1 time on my calf muscles. very strong as I can us the setting at 4 before it starts to hurt. The pads are great but the self stick isnt very good but those are cheap to buy new. Over all this is a fantastic product and I would buy it again. 5 I purchased this digital TENS unit to replace one that I have had for a few years that finally broke. This is a really nice unit with two channels and it comes with a nice rigid carrying case. It has all of the functions I need and it has flecible programming. I am surprised to see how much it has gone up in price since I bought mine just a few weeks ago. [...] Anyway, I love the unit. It works great for me and it certainly is better than taking pain pills. 5 I ordered this device almost 2 years ago and it is still running strong. Like others have said, it packs a punch and does the job to relieve pain. I have A.S. which causes a great amount of pain, and without this machine I would have a whole lot of difficulty getting through the day. I can attach it to my belt and walk around with it on or use it while sitting/laying down. I would definately recommend this or any other TENS device for personal therapy/treatment. It has also allowed me to cut down on pain medication which is probably the biggest benefit of the device. 5 I purchased one of these GREAT little units more than 2 years ago, and I couldn't be more pleased with its performance. My lower back pain is muscular in nature, not spinal, and is aggravated by my physical work. Using this TENS unit, I have been able to drastically reduce my use of pain medication. Friends and relatives have borrowed the unit from me, and have loved it enough to buy their own. If I could give this product a 10-star rating, I would! 5 I purchased this little unit and i was impressed with the power from the little box! for a 9volt battery it packs a punch where i need it most! its helping with me sciatica flare ups, nerve damage and most importantly it helps me from clotting which I have inherited thrombosis called factor V leiden! 5 I bought one of these LG7000 three years ago and I very satified with it's results. If you follow the manual and the placement chart, you will get positive results. I highly recommend this unit for beginners. My unit still function well and I found I don't have to use it as often anymore. 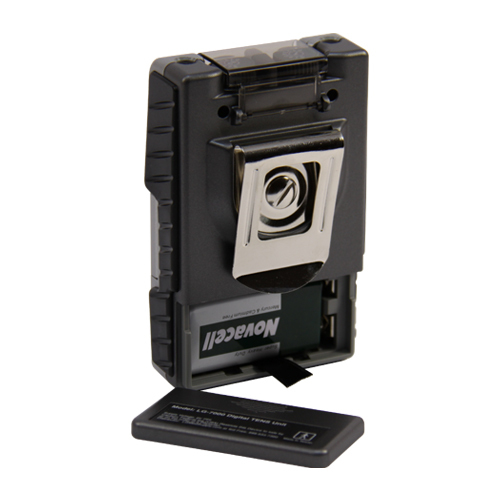 5 I am very impressed with this product. I was a little skeptic about this product due to the size and price very inexpensive. Well great things come in small packages. The system is just as powerful as the one I used in physical therapy. And due to its small size. It is easy to use anywhere. The delivery was very fast also. I would recommend this system to anyone looking for a tens system. Great price & great service. I would also recommend ordering the rechargeable battery. .99 for a charger and battery is a great price especially with the prices of 9 volt batteries today. 5 Excellent unit all the way around, the burst mode is the most effective, i'm a fitness trainer and therapist this unit works great on everybody I used it. 100% recomended. 5 Great product that arrived very fast. One of the only things that helps for my lower back pain. 5 Best Money Spent on Medical Care!! !, May 13, 2009 This is my second purchase of this tens 7000. I gave them as gifts to family members who have low back pain, shoulder pain, sciatica, knee pain. The great thing about this is that you can use it at home, while at work or shopping. I have thrown my back out in the past and have spent over 2 weeks trying to get the muscles to relax so I could heal. In the last 2 years I have had 2 incidences of my back muscles going into spasms from heavy lifing or doing too much yardwork. With the Tens 7000 I was able to apply the electrodes and run the device for most of the day while awake. This relaxed the muscles enough that I could straighten out my back. Otherwise I would have been hunched over for several days. In 3 days of use I was back to almost normal and able to walk straight and perform my job without being in constant pain. 5 Very pleased with my purchase. The tens unit was exactly as described and the seller took personal care in carefully packaging the unit for shipping. Would definately buy from them again. 5 I have bought from this selling prior. I purchased this product for my father. I have purchased a Ultrasound system from them a TENS unit and electrodes. The products are top quality and the delivery was within 3 business days. 5 i bought this unit for my daughter who suffers from severe pain from endometriosis. she has used it a couple of times and she just told me it is good after trying out many different pain meds which were useless and did not help. 5 I received this unit today and it's already working. I am completely impressed. The shipping was very fast and I love it! Thanks guys! 5 Very happy with unit, I have had a bad back for 30 years from an auto accident. It reallys helps the pain, great price on this my doctor wanted me to spend over dollars on one, this unit has the same effects. Had item very fast. 5 After attending physical therapy, the therapist regularly connected me to a huge 'TENS' machine which helped to minimize the pain considerably. I never would have imagined this little tiny unit would be at least as effective! It runs on a 9-volt battery and is portable. I've already recommended it to several friends who have purchased it as well. Thank you for a great product! 5 It came quicker than I expected. My mom is so happy she has it to help her sciatica. I would recommend this to anyone suffering from constant pain! thank you so much! 5 This little TENS unit is a great device with a wide range of settings. I regularly go to a chiropractor that uses a large professional TENS unit that does wonders. This little thing does just as good as that unit! I'm very impressed with it and would recommend it to anybody looking for a small, two lead four pad unit. 5 Ordered this on Monday, received it on Wednesday with regular shipping...item is great and FAST shipping! Will do business with again! 5 I used this TENS unit in physical therapy and they wanted to charge a fortune for me to buy it. This unit is an excellent way to minimize pain in an unintrusive manner. If used properly, it will provide almost immediate pain relief that will last without the use of medication. It also helps to do stretches before and after use in order to keep the muscles relaxed. 5 Had item in two days. Works great!!! Would definitely use this seller again and recommend to anyone needing this type of equipment. Very satisfied customer. 5 the tens unit is surprisingly effective for such a small unit. When I purchased it for my husbands lower back pain I wasn't sure if it would be strong enough to be helpful but it is.